We’re winter lovers in the Kootenay region. We look forward with anticipation for the first flakes to fall in autumn, rejoice in days upon days of snow-filled forecasts through winter, and, come spring, celebrate all the powder our mountains held. This kind of love spurs traditions: traditions that pay tribute to our snowy skies, nudge the “powers-that-be” to continue blessing us with snow and provide a token of gratefulness in hopes that we can live it all again come next winter. And while you may be familiar with a few of these winter traditions in other areas, you’ve never seen it done like it’s done here with our eccentric Kootenay vibe. Winter festivities are the norm in our mountain towns—in fact, history records that Canada’s longest-running fest started in our own Rossland with the town’s Winter Carnival. What began as a gathering that Olaus Jeldness, a Norwegian transplant to Rossland, initiated atop a summit in 1898, is now a beloved tradition that the West Kootenay town looks forward to every year. In true Kootenay style, Rossland’s Winter Carnival is an 'anything-goes party' structured to share a love of all things snow—from purposefully iced-up streets for the annual bobsled race to spirits served at a bar entirely made of ice. For 15 years now, Kaslo has celebrated winter and all kinds of traditional winter activities at the annual Winter in the Forest Festival. Held annually on BC’s Family Day, the celebration includes street hockey, ski races, snow painting, woodsmen competitions, local music and traditional Canadian edibles. There’s even a 'human dog sled' race. 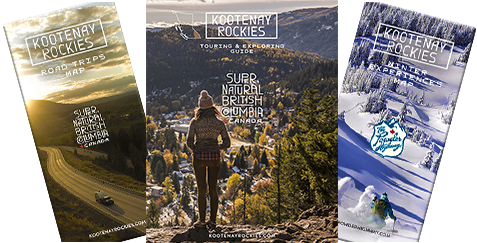 Each Kootenay town has their own special twist on winter festivals; no matter where your travels take you along the Powder Highway, these winter parties are worth your while. With all the huge bodies of water in East and West Kootenay, you know our people are taking the plunge. Call us brave (or call us nuts): Kootenay natives love the cold. So if we have the chance to put ourselves to the test and prove our hardiness, we’ll do it. Besides, a cold-water dip preps us for anything our winters might throw at us. These polar bear swims often come with the added feel-good benefit of charitable giving, too. For example, Nelson’s New Year swim benefits stewardship efforts for Kootenay Lake (where the event is held each year) while Invermere’s “Rad Plunge Challenge” at Kinsmen Beach along Lake Windermere supports the purchasing of adaptive ski equipment. But with or without the charitable aspect, these events have a warm side too—from hot chocolate to hot tubs. For over 30 years, Trail has been making use of the winter waters Columbia River for their annual event. No matter whether a participant or simply there to provide moral support, event goers are treated to a fire on the beach, prizes, and community camaraderie. Sacrifices have been made to appease the gods for as long as humans have believed in a higher power. It’s no different for skiers, snowboarders, and the outfitters that host them. “Russ, my husband and lead guide, builds a ‘Stumpy’,” says Courtney, co-owner at Ice Creek Lodge a backcountry lodge for skiers and snowboarders in the Valhalla Range of the Selkirks. Described as a life-size skier built of logs, 'Stumpy' is built for one purpose: as a fire sacrifice to Ullr. Donning skis, it is believed that this effigy, sacrificed in deference to the Norse god of snow, will send a season full of powder to those who observe the tradition. Ski Sacrifice - Photo courtesy of Ice Creek Lodge. All good things must come to an end (even if just for a few months) and here in the Kootenays, we don’t let winter go without a last hurrah: pond skimming. This tradition combines the tools of winter (skis/snowboard, snow—including the melted variety) with sights common to the oncoming season: spring’s sunshine, shorts and everyone’s best vintage Hawaiian tee. Somewhat akin to the Polar Bear plunge, it’s likely that participants will end up taking a dip in the snow-chilled waters. But unlike the plunges earlier in the season, the goal with pond skimming isn’t to see who’s brave enough to take a dunk—it’s to successfully make it across, at speed, from one side of the pond to the other using skis and snowboards. No matter which Powder Highway resort you’re at, you’ll find its own version of pond skimming, but all running with a common theme: a community gathering of snow lovers sending off the season with a warm goodbye for a winter well-spent. Words by Gina Bégin and top/cover photo by Phil Best (at Whitewater Ski Resort).